Do you already use a logistic solution in compliance with the medical device and pharma regulations? Create more added value and rely on Swiss Post’s professional logistics solutions – a one-stop-shop solution which meets regulatory requirements on temperature-controlled storage and handling in accordance with GMP specifications. The logistics centers in Villmergen meets the strict requirements on the storage of medical and pharmaceutical products and is therefore officially approved by. Our qualified know how to handle sterile, pharmaceutical and medical goods. Your sensitive products are stored securely and in accordance with the regulations in our temperature-controlled AutoStore unit. We carry out order-picking of your goods in accordance with your requirements. We comply with all regulations of the Ordinance on Medical Devices. Structural and organizational procedures guarantee the necessary security. Swiss Post runs an central automated storage facility for several hospitals. Suppliers no longer make individual deliveries to the hospital, but instead bring the various goods directly to Swiss Post’s central logistics center. Here they are checked and stored long-term or temporarily storage and inspection of your items. with the support of the system. If required, cross-docking is carried out where goods delivered by external suppliers are combined on a time-specific basis with the hospital’s centrally stored products. The orders from individual hospitals are supplied on a ward-specific basis and transported to the agreed location in accordance with regulatory guidelines. GDP-compliant and actively or passively temperature-controlled transport complements Swiss Post’s range of environmentally sustainable services. The storage of medicinal and pharmaceutical products is targeted to hospitals, clinics and homes as well as manufacturers and retailers. The outsourcing of their entire logistics operation, or a part thereof, to Swiss Post means being part of an efficient, sustainable logistics solution, covering the entire Swiss healthcare system. Bundled, centralized storage and order-picking of medical consumables even cabinet specific, together with customer-specific delivery times (day and night) are Swiss Post’s core services. Swiss Post enables you to achieve optimal efficiency in your processes by deploying integrated flows of information assisted by innovative sensor technology. A highly experienced project management team provides support on individual projects. An optimal transport concept, integrated certified sterilization solutions and incorporated customs clearance significantly shorten the turnaround times of instruments and implants. Combined with the vast experience of Swiss Express Innight Medica, we ensure optimal process efficiency. Our innovative special services are ideal for patient-specific order-picking and gathering of goods to the point of use. We work closely with you to develop the secure transport and storage of samples with integrated request management. The archived samples can be requested at the same time as encrypted examination reports. Automated stock reordering of materials and system-oriented equipment management complete our portfolio of services for you. 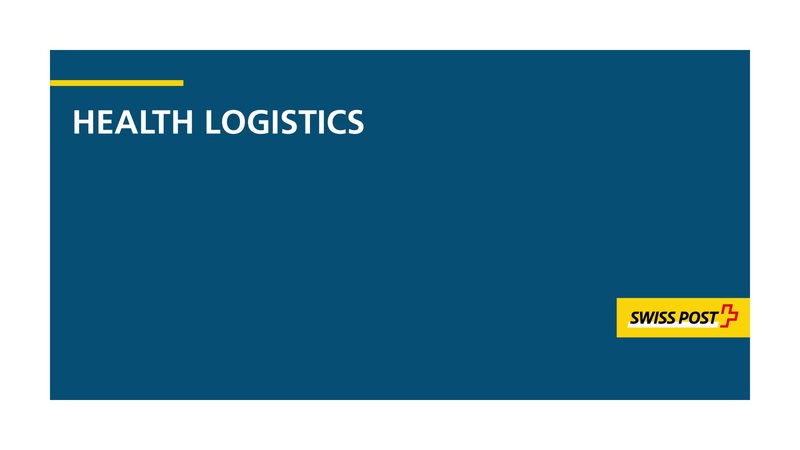 Swiss Post collaborates closely with you to develop logistics solutions for the special requirements of research, development and production with the integration of international access. We provide solutions for temperature-controlled logistics and sensitively managed transport for the secure delivery of goods – connected both physically and digitally. Always in compliance with all regulatory provisions. Swiss Post guarantees compliance with pharmaceutical industry requirements by using temperature-controlled, intelligent transport systems. Direct imports and storage are linked to a highly efficient multi-channel distribution network. You benefit from the cost-efficiency and sustainability of this solution. New structures require a new logistics logic and innovative B2C solutions are becoming increasingly important. Swiss Post’s mail carriers are out on the roads – near to your patients’ homes. Our digitally linked delivery and returns management allows you to benefit from a wide range of services in future. This will also enable you to remain close to patients outside of the hospital, your home or your pharmacy. We will provide a proof of disposal and are happy to draw up customer-specific disposal concepts upon request. You have a billing relationship and an individual contract with Swiss Post. I do not currently have a billing relationship with Swiss Post and wish to set one up. What information do I require to obtain a quote? We require information on the volume requirements and the type of goods to be stored and transported depending on the complexity of the logistics solution. Your contact person will be glad to guide you through the process of preparing an offer. Our project team will provide assistance for complex project requirements. I have a special requirement and don’t know how to resolve it logistically? Please get in contact with us and we will assist you in finding a solution. I’ve got a requirement that is not included in the descriptions above. What can I do? Please get in contact with us. We are continually developing our solutions and your ideal innovative solution may already be available but as yet unpublished. I need a new supply method. Can Swiss Post help me with this? Our core competency lies in physical and digital logistics which means we can design suitable, networked supply concepts for you. Get in touch with us and we will be pleased to advise you. I’ve got some questions concerning regulations. Who can I contact? Please get in contact with us and we will connect you to our pharma competence center or other suitable experts. My company is not located in the Region of Argovia. Would central logistics be the best option? Due to the efficiency of our processes and transport network, processing should be verified first to ensure it is sustainable and centralized. If special circumstances mean another solution is required, Swiss Post naturally offers other location solutions. We are planning to relocate. When is the best time to call in Swiss Post to draw up a new logistics concept? We will support you right from the start. Thanks to our partner network, we may also be able to provide assistance outside of our area of expertise. I’ve got a question about a Swiss Post product. Who should I ask? Please get in contact with us and we will find the right contact person for your query. I’d like to import goods from abroad. Does Swiss Post also handle customs clearance? Yes, we offer interesting customs clearance solutions; simply contact us with your query directly. I’ve got an idea I’d like to test in a pilot project. What can I do? Please get in contact with us. We are always interested in new solutions and will gladly review your cross-divisional idea. Our professional innovation team can clarify whether your idea can be piloted at the present time. I’ve got a question about the logistics center in Villmergen. Who should I ask? Please get in touch with us and we will find the right contact person for you directly on site. I would like to visit the Villmergen site. What should I do? Please get in contact with us directly and we will arrange an appointment.